We have developed an efficient strategy for the non-covalent functionalization of multi-walled carbon nanotubes (MWCNTs) which allows a biomimetic presentation of carbohydrates on their surface by π-π stacking interactions. 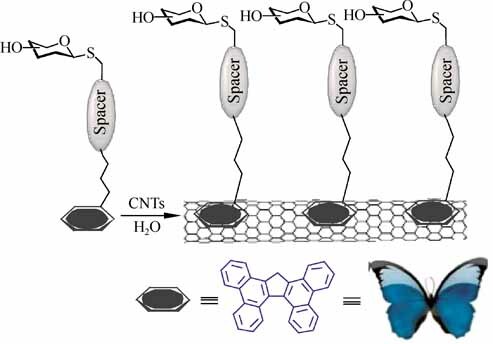 The strategy is based on the use of sugar-based amphiphiles functionalized with tetrabenzo[a,c,g,i]fluorene (Tbf), a polyaromatic compound with a topology that resembles a butterfly with open wings. The new carbohydrate-tethered Tbf amphiphiles have been synthesized in a straightforward manner using click chemistry. 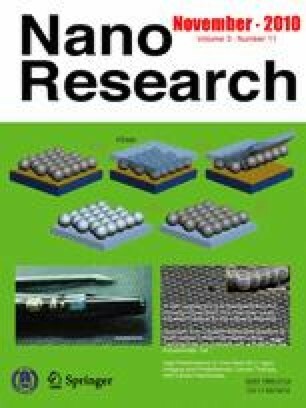 The reported method has been developed in order to improve the rather low ability of pyrene-based systems to exfoliate MWCNTs in water. By means of thermogravimetric analysis (TGA), ultraviolet (UV), infrared (IR), and fluorescence spectroscopies the interaction between MWCNTs and the Tbf group has been found to be stronger than those involving pyrene-based amphiphilic carbohydrates. The resulting aggregates with a multivalent sugar exposition on their surface are able to engage in specific ligand-lectin interactions similar to glycoconjugates on a cell membrane. Supplementary material is available for this article at 10.1007/s12274-010-0044-2 and is accessible for authorized users. Supplementary material, approximately 605 KB.